There are more instruments coming out dedicated to very specific sounds, so one dedicated to bass is no surprise. 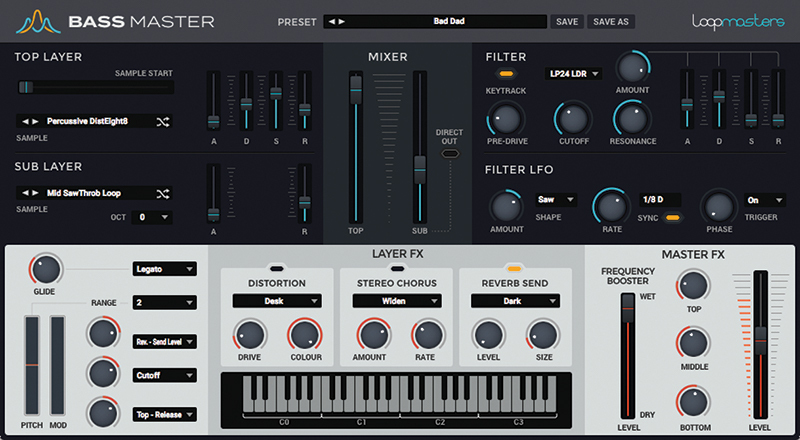 Loopmasters Bass Master is a sample-based instrument with plenty of on-board synth tweakage. It’s a 230MB download with 217 waveforms sampled from classic analogue and new machines. Two layers – a Top and Sub – mean you can have up to 50,000 combinations of sounds, and fortunately Loopmasters has gone to the trouble of providing 350 of them. These cover all bases (OK, basses) over 10 folders, including Simple (with bass guitar and saw type sounds); Swaggy (dynamic and squelchy); Harsh (in your face bass); and Modulated (dynamic, moving bass). 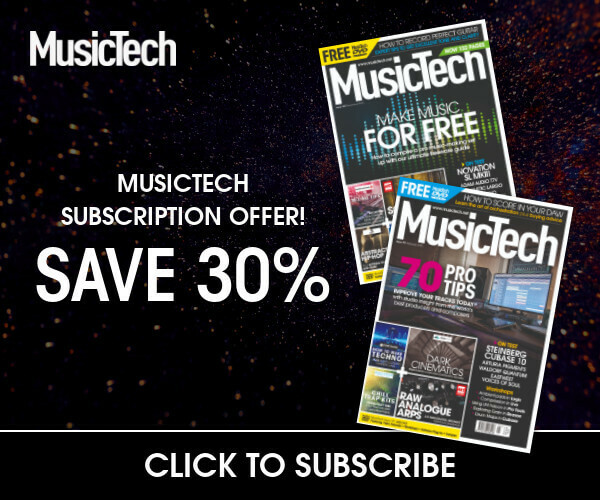 If you think 350 presets doesn’t cover much, then think again – this lot will have you asking how there can possibly be so many different bass sounds. The two bass layers are mixed with a central mixer and to the right of this, a large Filter section gives you access to 13 filter types and a Filter LFO. There’s also a comprehensive modulation section, bottom left. The Effects area deserves praise, with the Drive section offering some instant sound-changing options, while the Reverb is capable of adding a huge dose of atmosphere. The Frequency Booster compressor can act on three different bands of the sound to give you a final blast of sonic flexibility, and this rounds off an incredible amount of options to apply to your low end. Not that you’ll want to do much as the preset sounds are mostly to die for. We applied many to some old mixes and it was rather like adding a new foundation to our songs. The variation is huge, pulsing and as contemporary as you’ll find anywhere, and breathed some proper 2018 clout into some tunes that were more 1985 at best, if we’re honest. You might think you have your bass sorted with other soft synths, but it’s amazing what a focussed instrument can do to your workflow, and producers from all genres will benefit from Bass Master. Oustanding.